There have been numerous discussions around headless capabilities supported by the Sitecore platform. What product offerings from Sitecore support headless capabilities? How are each of the headless features different? A headless CMS is a back-end only content management system (usually built from the ground up as a content repository) that makes content accessible via an API for display on any device. A Headless CMS focuses entirely on the administrative interface, workflows, collaboration and the organization and delivery of content. It doesn’t concern itself with presentation layers, templates, site structure, or design. 1) The REST API for the ItemService - This has been available for quite some time (Sitecore 7.5). However it isn't always seen as true Headless due to it not including presentation details or personalisation in the response. Other APIs such as the Item Web API were available in older versions of Sitecore also. 2) JSS - This uses the Layout service (It has it's own individual JSON structure and named configurations) to support Front-end Apps (e.g React, Angular, Vue) whilst maintaining full Sitecore Experience Editor and personalisation features (page-level content composition, multi-variate testing etc). This is seen as a true Headless offering as it returns serialized presentation details as well as support for tracking and analytics. JSS requires a consumption based licence (at time of writing). 3) SXA - SXA also uses the Layout Service (again with it's own individual JSON structure and named configurations). This powers the SXA Components. SXA is available with a perpetual licence (at cost) as well as included in an consumption based licence (at time of writing). At this point in time if you want true Headless support you must therefore have the JSS or SXA modules included in your Licence in order to have access to the Layout Service. 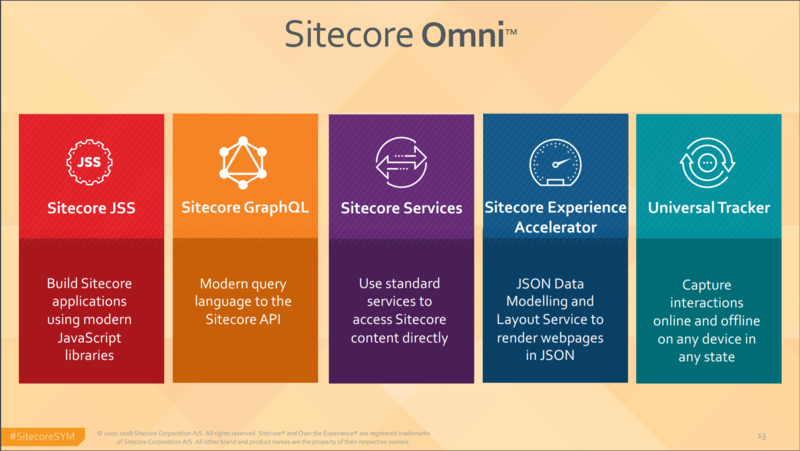 In Sitecore 9.1 JSS, SXA, Sitecore Services Client API and other services come together in what is being referred to as Sitecore Omni. The idea is that Sitecore Omni Delivers individual experiences connected and disconnected to any platform with the full power of the Sitecore Experience Cloud. So in 9.1 and beyond JSS and SXA are just part of the headless architecture and there are other elements that play important roles too. 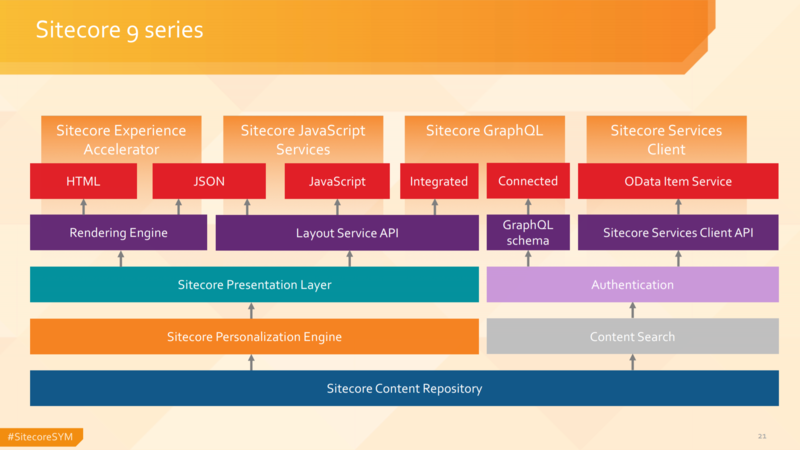 The images below from Mark van Aalst's Symposium 2018 presentation (Sitecore Headless Revolution) describe this in more detail and the architecture. At its core, headless CMS is the decoupling of rendering from content repository. Turning the CMS into a part of a more general overarching architecture where many other sources can also have input into the rendering of a site (i.e. PIMs, CRMs, REST services, etc). This decoupling frees implementers from having to worry as much about the technology choices of the CMS, as well as provides greater flexibility compared to a CMS that tightly couples rendering and content data - the implementer truly owns the architecture of the rendering environment, with much less influence from the CMS. Headless is more or less the CMS response to modern architecture trends where systems are becoming much more distributed and scaled. What headless even mean in Sitecore Context? In a very layman's term Headless CMS means decoupling the back-end (The Content Repository) and front-end (The Website) of a Content Management System. To extent the usability of a CMS its not always mandatory to use both aspects of it. Rather there are many scenarios where just exposing the Backend to be utilized by multiple channels to achieve Ominchannel Rediness and reduce the Time to Market. This can be done using RESTful APIs, Microservice Architecture etc. This Wiki explains the difference between Coupled / Decoupled / Headless CMS precisely. Like every other CMS, Sitecore is also built with a back end (Databases, Services) and front end (Sitecore IDE). Hence in Sitecore there are 3 possible ways to go Headless and expose just the back end as described by Adam in his excellent answer i.e. REST APIs, JSS and SXA. Not the answer you're looking for? Browse other questions tagged sitecore-api or ask your own question.